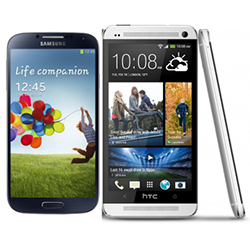 The Samsung Galaxy S4 and the HTC One are going to be the top contenders for this year in the Android world, but who out of these two flagships will make it to the very top? Both HTC and Samsung have worked hard on creating a design for both of their flagship handsets and both have taken different approaches. Whilst the Galaxy S4 has a lightweight plastic body, the One has a heavier sturdy metal build.